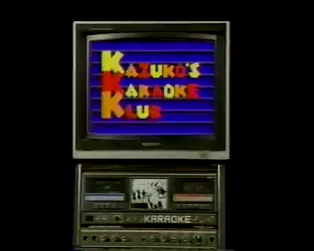 Hosted by Kazuko Hohki of Japanese experimental pop group Frank Chickens, Kazuko's Karaoke Klub was a weekly show which aired on Channel 4 for eight editions on Thursday evenings in the summer of 1989. 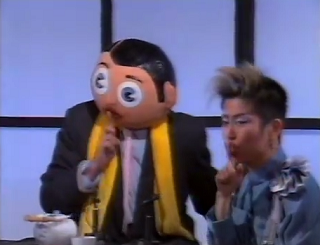 The series was a bizarre combination of Japanese culture, chat show frivolities and, the section which cements its outrageous curiosity value, karaoke strangeness. Celebrities appearing are far from the top tier of showbiz and, instead, are more a mixture of B-list / C-list celebrities such as Frank Sidebottom, Janice Long, Spike Milligan, John Cooper Clarke, Lynne Perrie and George Wendt. Oh, and there's the Operation Yewtree contingent as well with not just Jonathan King, but Jimmy Savile slithering their way onto the show. Now, Kazuko Hohki has a fine command of English (about a million times more capable than I'll ever be with Japanese), but the depth of questioning here is far from Parkinson or Frost levels. Naturally, the nature of Kazuko's Karaoke Klub hardly demands any sense of intellectual probing, but the questions posed here are banal and its left to the celebrities to wax lyrical to fill in the gaps. Frank Sidebottom, as ever, is brilliantly surreal and Northern whilst Billy Bragg's Essex boy brand of socialism is always welcome, but there's very little to glean from the interviews despite Hohki's cheerful enthusiasm. 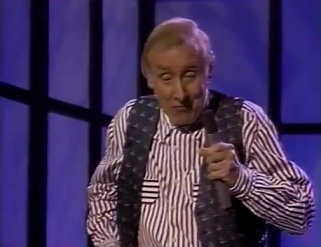 With the hindsight of everything that's unfolded in British television in the last few years, of course, Jimmy Savile's appearance is the most prescient. His self proclaimed boasts of a skillful prowess with women and the accompanying rage of their disgruntled partners truly makes you squirm. Savile features on an episode alongside George Wendt and I really do wonder what he made of this odd character who, even back then, baffled people with his ability to become such a strong sinew in the flexing muscle of British entertainment. Moving back towards the format of Kazuko's Karaoke Klub, the karaoke sections fail to sparkle in any way, shape or form. Spike Milligan 'Spike Milligans' his way through Yesterday, Savile takes on It's a Long Way to the North of England and Janice Long hits the high notes in Leader of the Pack; the chances of anyone ever wanting to see or hear such combinations are zero, absolutely zero. The audience appear to be laughing their behinds off, but the number of empty glasses on their tables also indicate that they're completely smashed. And that's perhaps the only way that Kazuko's Karaoke Klub could ever be palatable.